The events I will talk about are the killing of nine worshippers at the African Methodist Episcopal (AME) church in Charleston South Carolina, the church bombing which killed four teenage girls at a church in Birmingham, Alabama over 50 years ago, and the Watts Rebellion, one of the most famous of the riots of the Sixties that developed in Black areas of major United States cities. I’ll look at the events on the US chart — since they all affected the United States, and also the charts of the respective cities. 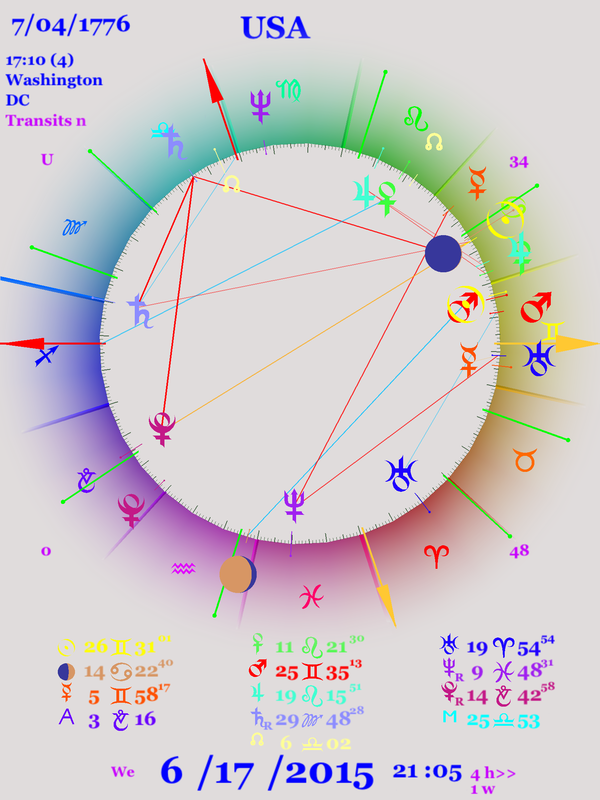 The charts are from Carolyn Dodson Horoscopes of the U.S. States & Cities (AFA) and are drawn for 12 noon local mean time if time zones weren’t observed on the date for the city. Mars, the planet symbolizing violence and gunfire, will be prominent. The shooting of many people and the killing of nine at the AME church in Charleston. South Carolina was recently in the news, and the current removal fo the Confederate flag from the capitol grounds in Columbia is well covered. But South Carolina has a history that led it to this point. South Carolina was settled by British colonists from the Caribbean, who were quite devoted to slavery and whose behavior made the English colonists of Virginia look like abolitionists in comparison. Virginia was settled by colonists from England who had been on the wrong side of the English Civil War (Cavaliers) as opposed to those colonists in the sugar colonies who had been away from England for some time. South Carolina was famous for getting Jefferson to withdraw the condemnation of slavery from the Declaration of Independence, for starting nullification (a forerunner of actual succession) in 1833, as led by Senator (and vice president during Andrew Jackson’s first term) John Calhoun, considered one of the three most influential senators (along with Daniel Webster from Massachusetts and Henry Clay of Kentucky) of antebellum America. It was the first to start withdraw from the Union, and the first shot of the Civil War was fired at Fort Sumter in South Carolina. So South Carolina has a long reputation of being recalcitrant. Whites had long tried to get freed blacks into churches, and the Methodist church was particularly successful at this endeavor. However, there was a major contradiction with the fact that many whites in those churches shunned the black members. In 1816 a wholly-run black church was formed for black parishioners, and this was the African Methodist Episcopalian or AME church. The first one was in Philadelphia, but the movement rapidly spread, one of the first AME churches established was in Charleston, South Carolina. In 1822 it was accused of involvement with the slave rebellion led by Denmark Vesey, which was discussed previously. This particular potential slave rebellion frightened all of the South, and led to the burning of this Emanual AME church. Finally, in 1834 all black churches were made illegal. So this particular church has a long history in the South, being the first AME church established in the South, and so was a apt target for this terrorist activity. Some of the same conditions we mentioned previously when talking about the Summer Solstice chart also apply to this event, which took place just four days earlier. The Sun was conjunct Mars and Saturn in hard aspect to Pluto, both signs of potential violence. Neptune makes hard aspects to both Mercury and Uranus of the US (see below) which suggest the initial confusion about the incident. But in addition to the hard aspect between the transiting Saturn and the transiting Pluto, both make hard aspects to the natal US Saturn, accentuating the Saturn Pluto difficulties. In the chart of transits to the Charleston natal, we notice immediately that Jupiter is at the MC. Amongst the outcomes of this shooting was country-wide talk about the confederate flag and its meaning, and the lowering of that flag from the grounds of the State Capitol of South Carolina. Transiting Saturn and Pluto make hard aspects to the Charleston Mars, reiterating the possibility of violence. But look at the current transits within this cart. We see that transiting Moon is tightly opposite Pluto and makes a sesquiquadrate to Saturn. While we don’t know how long the shooting lasted, it was certainly several minutes after the given time. The opposition between the fast-moving Moon and Pluto was so tight that it became exact in 17 minutes, at 9:22 that evening, and this opposition was loosely on the natal Uranus of Charleston. Another incident of a terrorist incident at a church occurred in 1963, at the 16th Street Baptist Church in Birmingham, Alabama. In this case, members of the Ku Klux Klan blew up a church with dynamite. The bombing was set to go off when church service was happening on a Sunday, and as a result four teenage girls were killed. Even though soon after it was known who did the bombing, no prosecutions happened until 1977. Supposedly the intent of the bombing was to intimate the people in the Civil Rights Movement in the Southern United States, but if that was the purpose it went completely wrong and the Movement was strengthened and one result was the passage of the Civil Rights Act of 1964. The first thing I notice in the transits for the time of the bombing — which is exact — to the US natal chart is that transiting Mercury is on the US MC — this event was communicated to the whole world and had (unexpected by the perpetrators) many repercussions. The Uranus Pluto conjunction of the Sixties is just forming, the decade is just under way. Pluto is sexquiquadrate the natal Pluto, emphasising the unfortunate consequences of the US natal Pluto, which has been often explored here. Transiting Moon is opposite the natal Moon, significant because of the exact time, indicating that the people of the US were effected by this event. Finally, transiting Saturn is sesquiqadrate the Midheaven and natal Venus. There was much worry expressed at the time that this event would reflect badly on the US in its cold-war rivalry with the Soviet Union. In the transits to the Birmingham chart, transiting Mars is square natal Mars, suggesting the violence of this act. Mercury is square the MC — news of this event was quickly spread — but Neptune is semisquare the MC, and as indicated it took over a decade for convictions in this case, something was causing illusions of who was the guilty party. The third incident was the Watts Riot of 1965, thought by many to be a rebellion. Summers of the decade of the Nineteen Sixties saw many riots in Black communities around the country, and one of the best known, but not the first, happened in the Watts section of Los Angeles , California. It started on the evening of August 11, 1965 and spread over most of the following week. A drunken motorist, only 21, was stopped in his mother’s Buick by a white Highway Patrol officer and the arrest got out of hand. Fires and looting continued for several days. The black citizens of Los Angeles suffered from unemployment, and later the police were found to be guilty of racism to minority citizens. This does not sound very different from current situations that are inflaming people around the country, and the news reports on a daily basic. This riot was well covered by the news media since in occurred in a major media center of the country. In the chart of the US for the time of the Watts riot, the first aspect to notice is the tight conjunction of Uranus and Pluto. The event did occur in the Sixties, and the significator of the Sixties is clear since this was the time of the exact conjunction of 1964 and 1965. 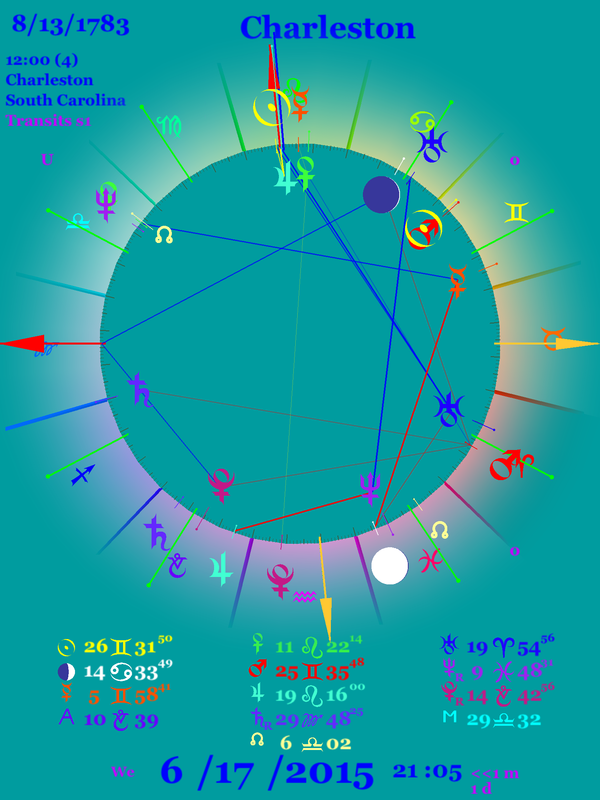 The transiting Mercury is opposite the Moon, and this indicates that this crises was communicated to the people of the US. But most important is Mars, planet of violence. It squares Mercury (communications again) and sesquiquadrates Uranus. Mars-Uranus hard aspects are notorious for unexpected violence. But this position of Mars also accentuates the tight natal Uranus-Mercury semisquare, which is fundamental in the self image of the United States. Perhaps the rioters at Watts were angry that this promise of the US as suggested by this natal aspect was not given to them. We also saw this in the Charleston massacre to US chart above. 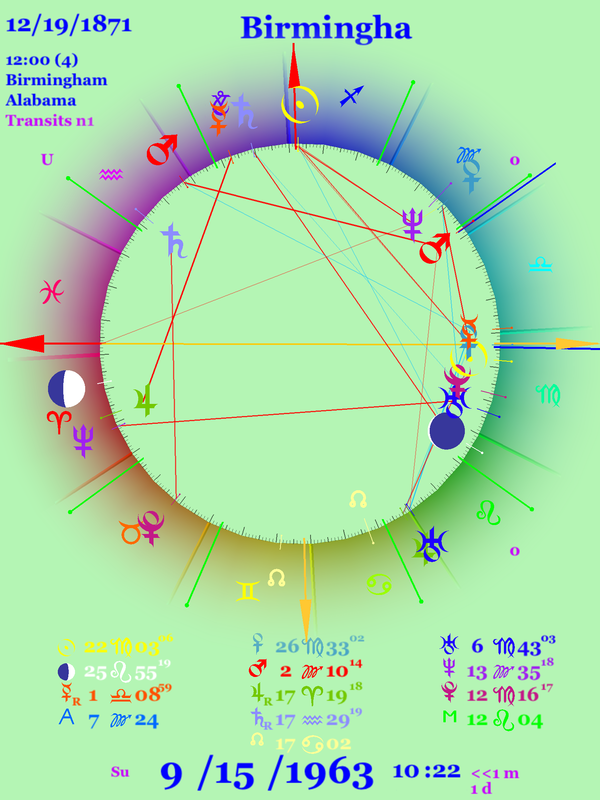 In the chart for this Event in the Los Angles chart, we see Venus — peace — setting on the Descendant of the LA chart, and Jupiter — fortune — at the lowest point in the chart, the IC, and thus opposite the Midheaven. Both peace and fortune were sadly missing from the Watts riot. Transiting Mercury is sesquiquadrate the naatal Mercury, communication again, and transiting Saturn was square the natal Mars — frustration, difficulties in expression of energy. I recently attended a Summer Solstice Ceremony held in a nearby community. Part of the ceremony was an interpretation of a chart for the moment when the sun was at zero Cancer — the Summer Solstice. 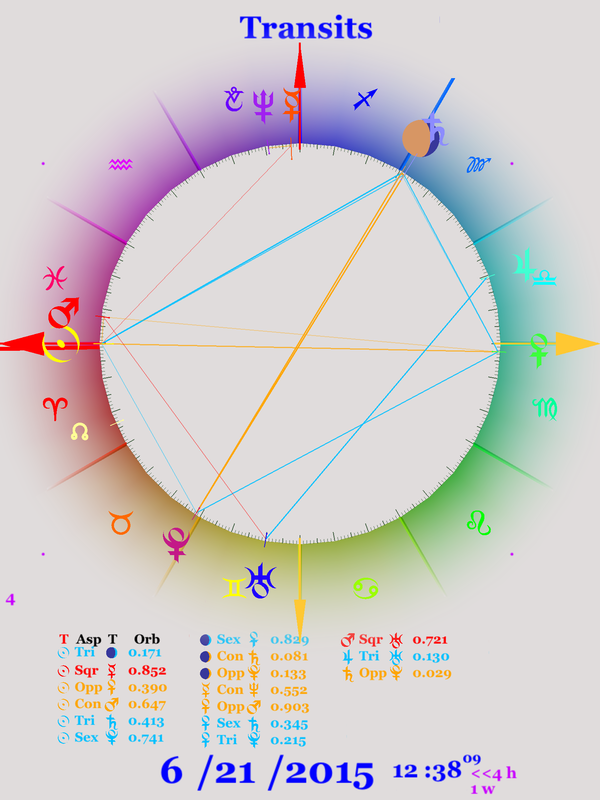 I had never looked at such a chart before, even though I had looked at a Capricorn Ingress chart for many, many years. 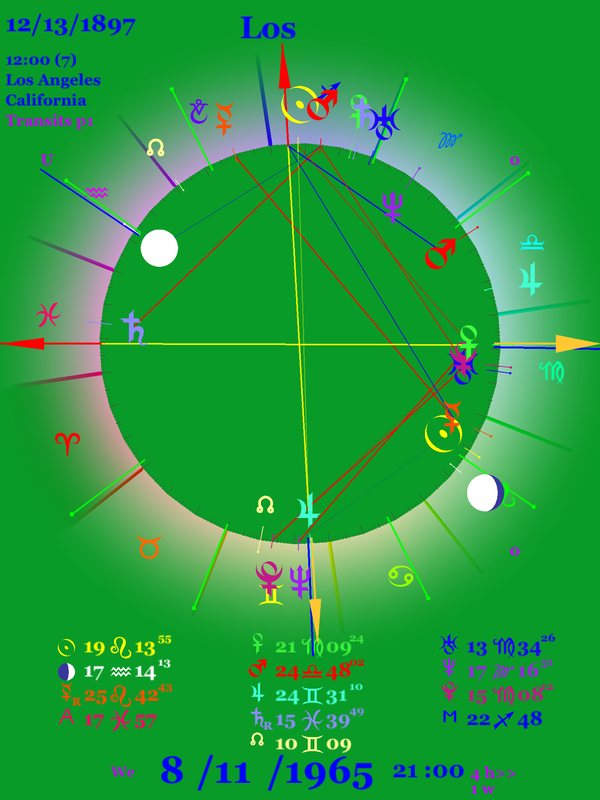 It is traditional among astrologers to look at ingress charts to gauge the upcoming year. The most common of these is the Capricorn Ingress chart, since the ingress of the Sun into the sign of Capricorn — the official start of the Winter season — is near the beginning of the New Year in modern societies. 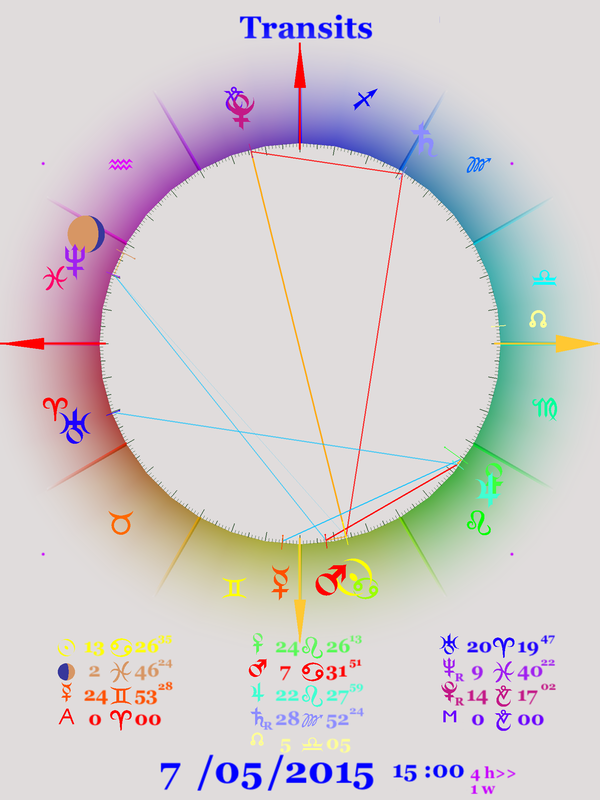 But since I was at this ceremony, I decided to also look at the Cancer Ingress chart, and I was a bit surprised. The hostess of the ceremony pointed out some interesting features of the chart, but her interpretation was a bit more “New Age” (appropriate considering the people gathered) than I would take. But I did see some things of interest for readers of this blog, and later I did a more in-depth interpretation of the chart. The first thing to note is that the Sun is conjunct Mars with an orb of less than two degrees. This is especially of note since the position of the sun is fixed at zero degrees cancer. Mars – Sun indicates violent, anger, warlike conditions. Not very peaceful. Lots of energy. Not a suggestion that the next year will be calm and gentle. The next thing I noticed was that Saturn was tightly square the Moon with an orb of less than 15 minutes. Again, since the position of the moon is fixed because of the nature of the chart, this aspect with the moon is also important. Moon-Saturn is depressed emotions or feeling on a personal level, or sad or constricted people on a nation level. Doesn’t sound like a lot of joy. But then notice the tight semi-square between Saturn and Pluto – orb less than three minutes. We’ve seen before the problematic nature of hard combinations of Saturn and Pluto, as in the start of the Spanish American War, World War I, World War II, the coup in Chile, and the 9/11 attacks. Completing the triangle is Moon sesquiquadrate Pluto, also tight with an orb of under 15 minutes. So this whole configuration of Moon, Saturn, Pluto are quite close to exact, and since the personal point the Moon is involved, this Saturn-Pluto is involved with the people of the world, the people will feel the troubles that ensue. And combine this which what was said above about Sun-Mars, and the near future seems like an explosive situation, though most likely in a figurative sense. In the fourth harmonic version of this event, we see that many planets are involved in the Moon-Saturn-Pluto complex. There is what is called a “Mystic Rectangle” formation, which involves two oppositions, two sextiles (short side of the rectangle) and two trines (long sides of the rectangle). The oppositions in this case are Moon-Saturn opposition Pluto and Venus opposite Sun. You can see how wide the Sun-Mars conjunction is when stretched by a factor of four in this harmonic chart. The sextiles are Sun-Pluto and Moon-Saturn-Venus. The trines are Pluto Venus and Sun-Moon/Saturn. In the two weeks since the start of Summer, we can already see this playing out. What I notice most strongly is the drama being played out between Europe (and especially Germany) and Greece. As I write this, Greece had already defaulted in the money it owes the notorious IMF (International Money Fund). The IMF was set up in the aftermath of World War II to support financial cooperation among nations of the world, but it has acted as an extortionist for a long time. The IMF is famous for the ravages — the demands that countries undergo Structural Adjustment — it has laid on Central and South America during the decade of the Nineteen Eighties — the decade of the start of neolibralism in the world stage, the decade of Reagan and Thatcher, and it seems to be living up to its promise. Germany and Greece had difficulties during World War II, when the Nazis took over in Greece, and it appears that the post-Nazi German government is still intent on taking a bite out of Greece, and the Greek people have not forgotten World War II. Here is a chart for Sunday, the day a referendum has be called in Greece to determine if they will remain with the austerity program. In this chart Saturn is still semisquare Pluto, but now Sun is opposite Pluto and sesquiquadrate Saturn, so it looks like Sunday is another Plutonian day, one in which the long knives come out. Whatever the outcome of the referendum on Sunday, things won’t improve, at least not in the short term. Those words were written before the vote in Greece. Now, several days after, and with a large “No” vote, we can se the Plutonian repercussions around the world. Some commentators a have said that the vote was the most important event in Europe since the fall of the Berlin Wall. It is certain to affect the political situation in many other members of the Eurozone, such as Spain, a well as the electorate in other countries such as the United States. The vote is being seen as a large protest against the wave of neoliberalism that has swept the world since the late 1970s. But of course other things are happening in the world. The day before the referendum was the 239th birthday of the United States and the beginning of a (very) long election season for the President of that country. That country is currently roiled with church fires and the killing of black people; the justice system of the United States is coming under increasing criticism. Extreme weather is attacking the West Coast of the US, and the major agricultural state California is seeing a news-worthy drought. The Middle East is seeing wide spreading wars. At this rate who knows what the world will look like in another 14 months.